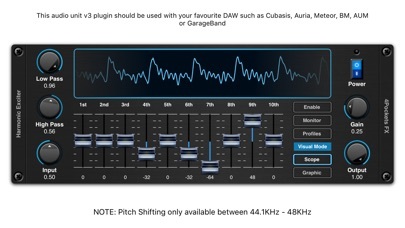 Harmonic Exciter is an AUv3 Compatible plugin for your favourite DAW such as Cubasis, Auria, AUM, Meteor, BM3 or GarageBand etc. 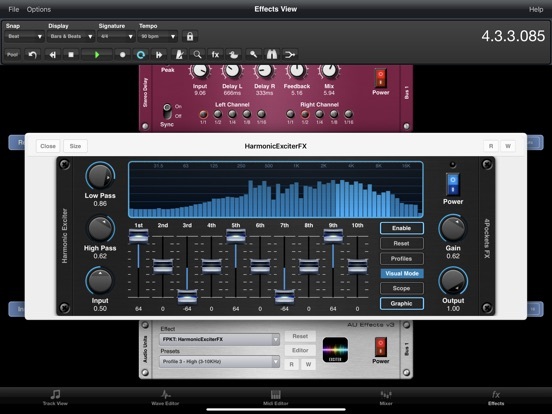 The main purpose of a Harmonic Exciter is to help instruments cut through a mix and give some edge and clarity to a sound by adding additional harmonics. 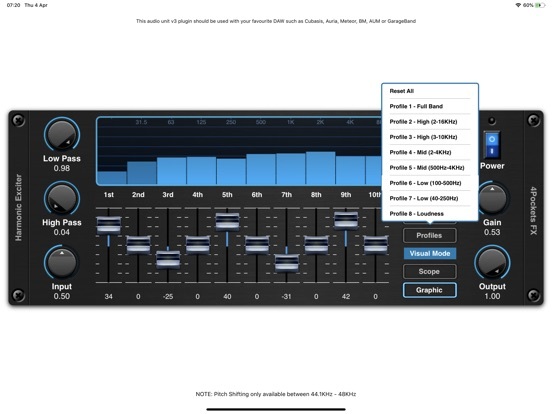 It can even be used to simulate valve / transister based saturation or overdriven harmonic distortion. Every sound under the sun can be constructed by a series of sine waves, the root sine wave denotes the fundamental percieved frequency or the series of waves. By adding additional harmonics which are simply multiples of the fundamental frequency you can turn say a simple sine wave into a square or sawtooth wave. For those who know anything about synthesis you will know these complex waves pack more punch and brightness for the same volume level. 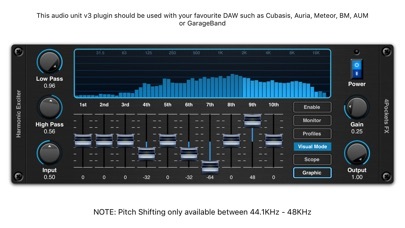 So by adding additional harmonics we can lift a sound and make it appear louder, brighter and stand our in our mix. 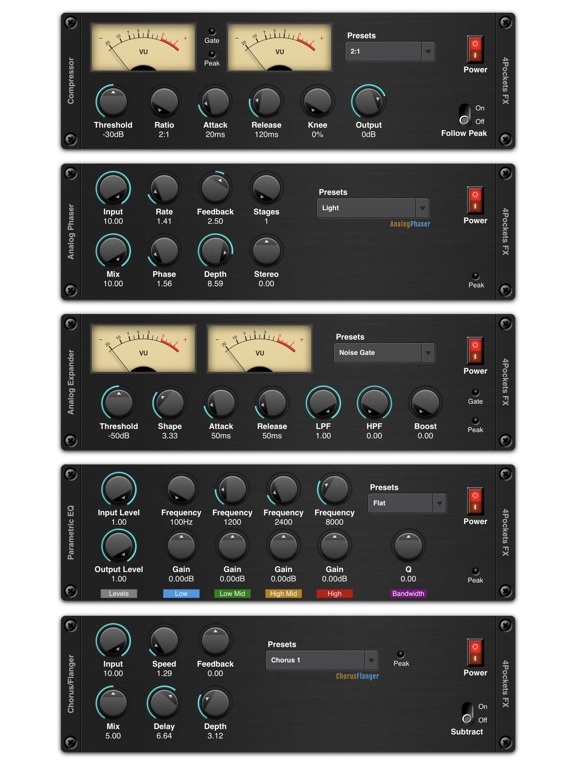 It can also be used to saturate say a bass frequency range boosting bass without needing additional EQ which simple boosts existing harmonics and oftern requires compression to keep under control. 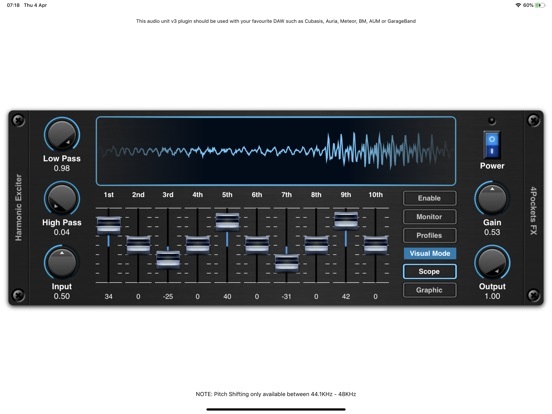 This makes the harmonic exciter a great tool for that perfect mix and a nifty trick audio engineers have been using for decades. 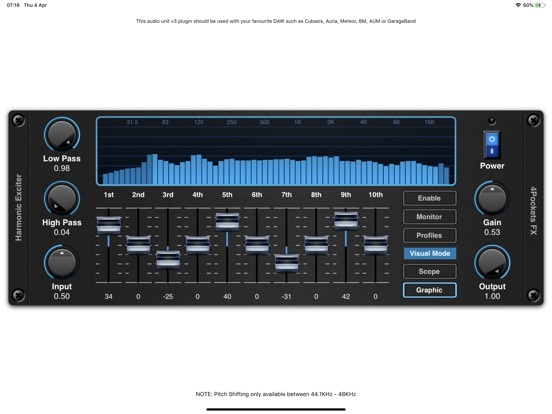 The 4Pockets Harmonic Exciter allows you to visually see the incoming audio spectrum broken down into frequency bands so that you can immediately see any deficiencies in the mix. 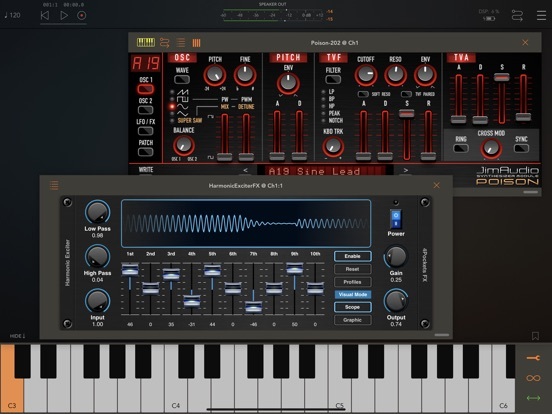 You can select a frequency range (whether bass, mid, high or even say a kick drum) and use the 10 harmonic sliders to dynamically synthesize of additional harmonics and phase manipulation. Generally it's the 'odd' harmonics that effect a mix in a more melodic way (1st, 3rd, 5th etc. ), while even harmonics (2nd, 4th, 6th etc.) tend to be a little discordant or can be used to mimmic distortion of valve amps etc. When adding saturation in this way you can create simulate pleasing overdriven valve/transistor type amplification (transistor amps generally only apply odd harmonics). 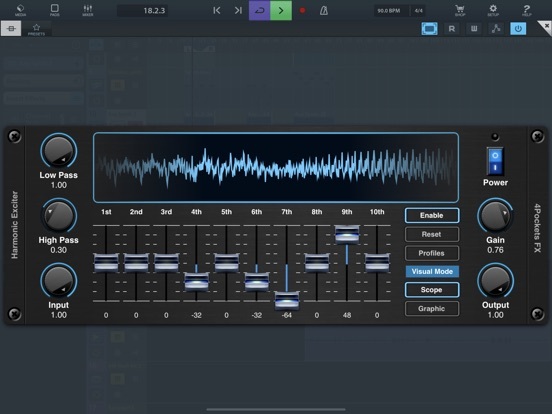 While you can boost EQ using a Graphic or Parametric EQ, this only boosts existing harmonics which soon requires compression to avoid clipping. The Harmonic Exciter changes the tonal content of a sound to saturate without adding the same boost in volume. The result is more punch and an ability to cut through the mix without levels getting out of control. You can often get a more natural and aurally pleasing saturation from this kind of effect than using a dedicated oversdrive effects. If your DAW supports MIDI based effects you can also control certain features via CC controllers or using the pitch bend and mod wheel (or CC's 20, 21 and 22 to control the exciter window, gain and size). Added a requested option to boost the effect for more extreme saturation. Added dedicated buttons for the scope and graphic display modes. 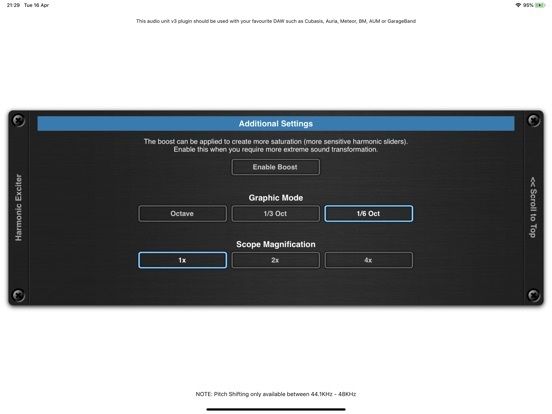 Saves the graphical modes as part of the saved state.